Your eyesight is one of the most important senses. So take care of your eyes. Regardless how careful you are accidents can happen, but everybody can make sure that they are prepared. With our eye wash solutions, you have done your best. If an accident happens, seconds can decide whether your eyesight is damaged or not. Therefore, quick access to eye wash is crucial for all workplaces where there is a risk of eye injuries. Our wide product range ensures the best possible solution specifically for your needs. Choose small and large wall-mounted stations directly at the workplace. Or small, mobile solutions for the van, the tool box and the first aid box, and on the cleaning trolley in the special belt bag. 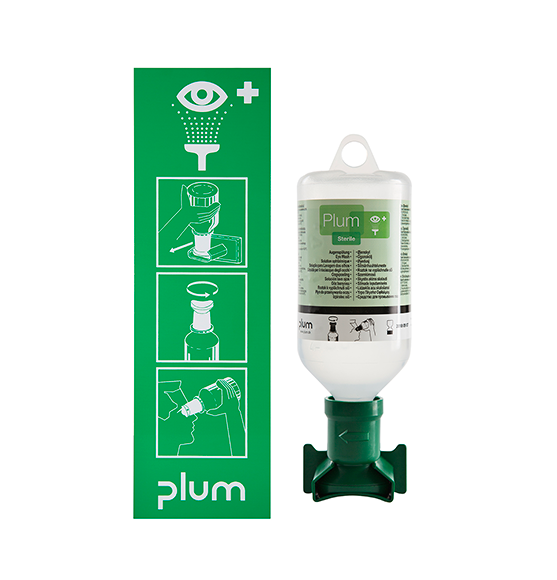 The green Plum Eye Wash deals with dirt. The blue pH Neutral is crucial in connection with accidents involving acids and alkali. A small and handy pocket-size bottle with 0.9% sterile sodium chloride. The bottle is easy to store in the specially designed belt bag, in the first aid kit, in the tool box, etc. It comes with a dust cap. Rinsing time: about 2 mins. A handy bottle with 0.9% sterile sodium chloride that can be used individually or as refill at eye wash stations and boxes. It comes with a dust cap. Rinsing time: about 5 mins. A small, handy pocket-size bottle with 4.9% sterile phosphate buffer that will quickly neutralize acids and alkali. 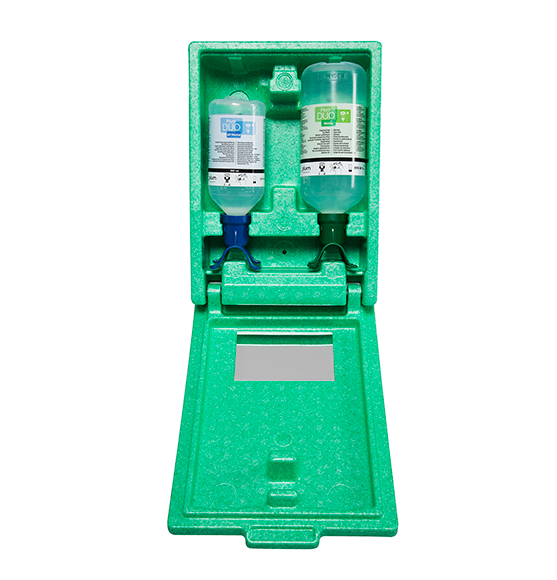 The bottle is easy to carry in the specially designed belt bag, in the first aid box, in the tool box, etc. It can also be used as refill at eye wash stations and boxes. It comes with a dust cap. 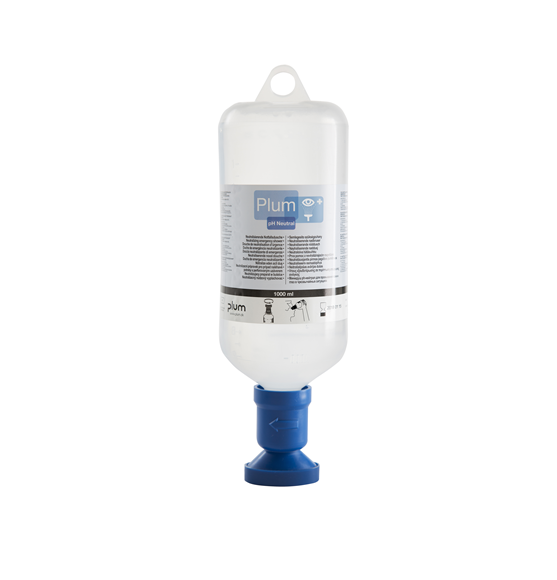 A bottle with 4.9% sterile phosphate buffer that will quickly neutralize acids and alkali. 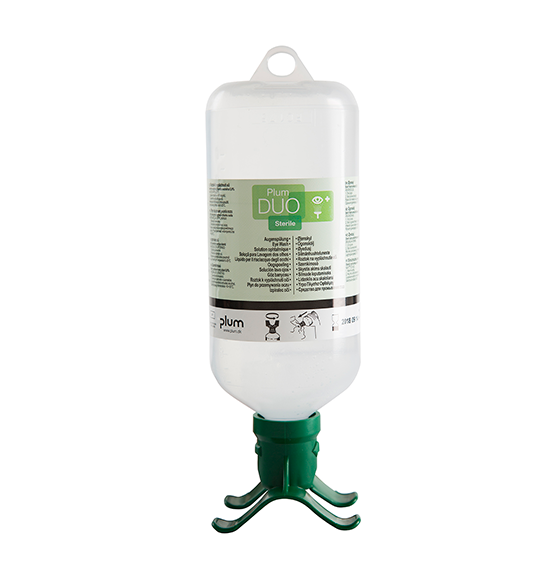 The bottle can be used individually at the workbench, in the tool box, the van, or mounted on the wall close to the workplace. It comes with a dust cap. Bottle with 0.9% sterile sodium chloride. Contains 1000 ml eye wash, which provides a longer rinsing effect. The ergonomic DUO eye cup makes it possible to rinse both eyes at the same time. 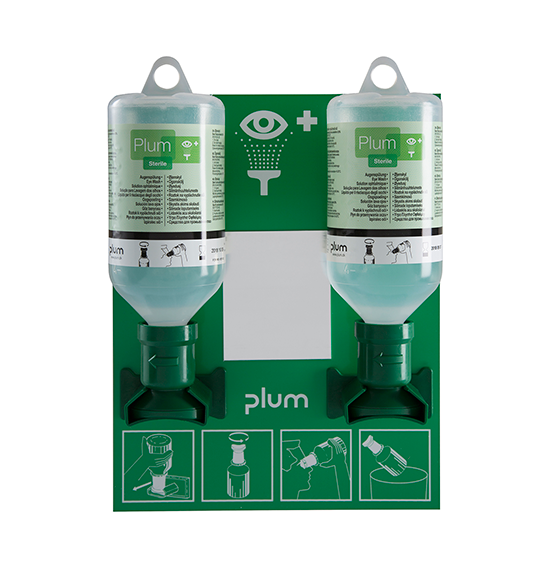 The bottle can be used individually or as refill at DUO eye wash stations and boxes. 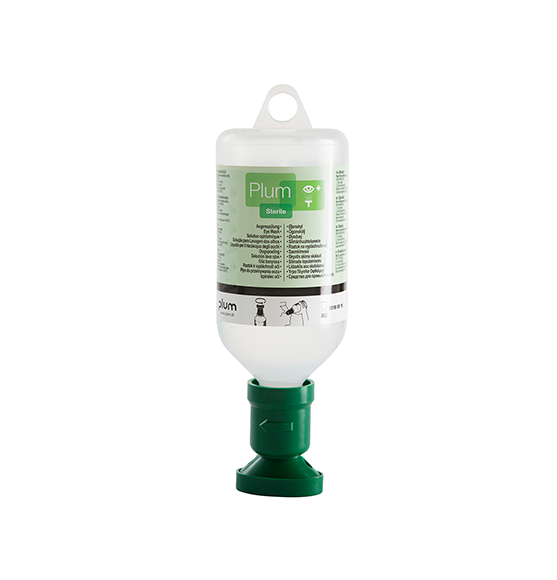 A handy bottle with 4.9% sterile phosphate buffer that will quickly neutralize acids and alkali. The ergonomic DUO eye cup makes it possible to rinse both eyes at the same time. It is particularly suitable for workplaces where there is a risk that both eyes are affected. 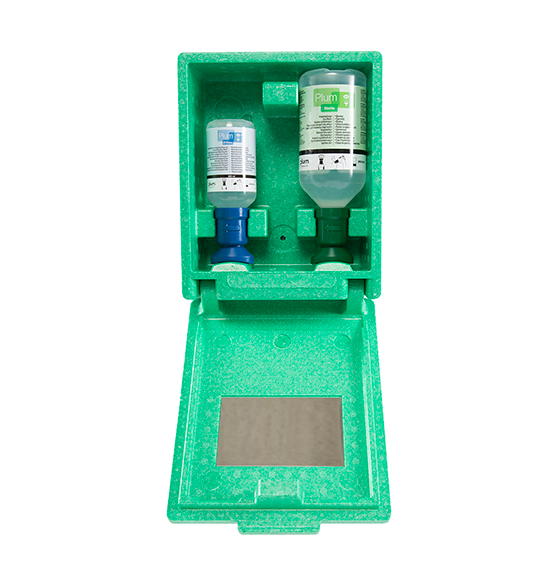 The bottle can be used individually or as refill at eye wash stations and boxes. Wall station with 500 ml Plum Eye Wash. Particularly suitable for small and mobile workplaces. Wall station with 2 x 500 ml Plum Eye Wash. Particularly suitable for environments and small workplaces that are not dirty, but where there is a risk of getting foreign bodies into the eyes. Rinsing time: about 10 mins. 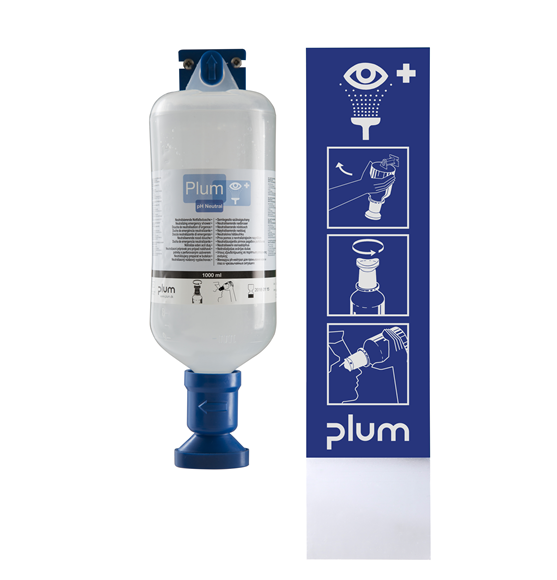 Dust-proof wall station in impact-proof polystyrene with 200 ml pH Neutral and 500 ml Plum Eye Wash. Particularly suitable for dusty production areas where there is a risk of accidents involving foreign bodies and acids and alkali. Rinsing time: pH Neutral about 2 mins. Plum Eye Wash about 5 mins. 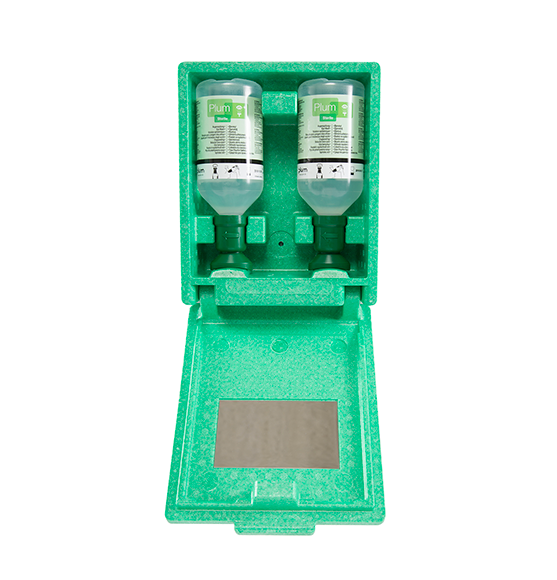 Dust-proof wall station in impact-proof polystyrene with 500 ml pH Neutral DUO and 1000 ml Plum Eye Wash DUO. Particularly suitable for dusty production areas where there is a risk of accidents involving foreign bodies and acids and alkali, and where there is a risk that both eyes will be affected. Wall station with 1000 ml pH Neutral, which will quickly neutralize acids and alkali. Suitable for mounting on the wall near the workplace. It comes with a dust cap. 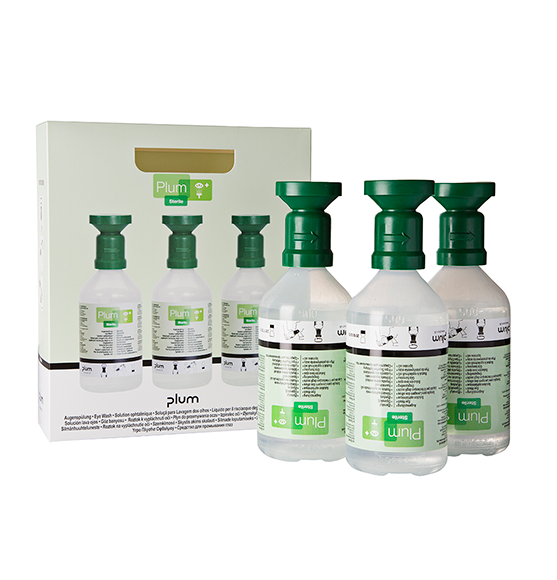 Practical and handy set with 3 x 500 ml Plum Eyewash bottles with 0.9% sterile sodium chloride solution. The box is easy to take with you in the car on the way to the doctor or the emergency room. 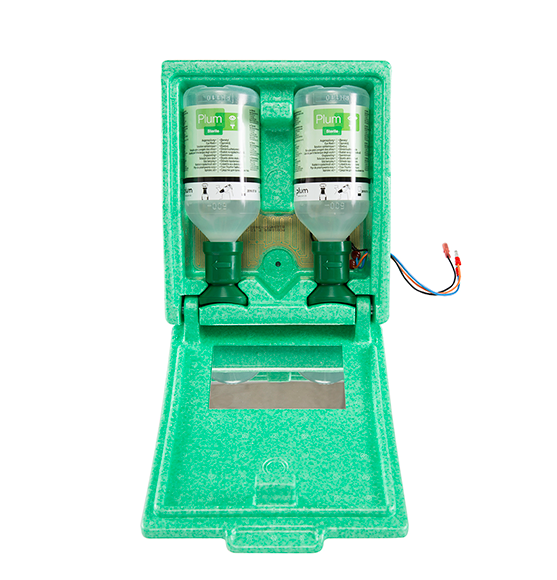 The bottles can be used individually or as refills in eyewash stations. 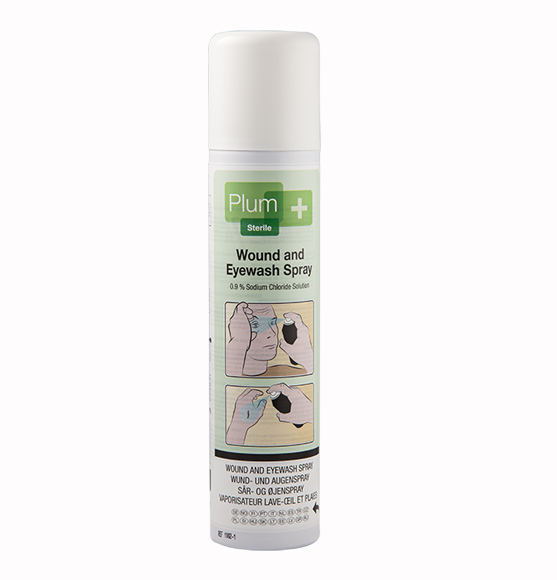 With the new Plum Wound and Eyewash Spray you get immediate and effective care to minor accidents such as cuts and scrapes on the skin or dust and dirt in the eyes. It helps you to minimize the risk of further infection or damage.